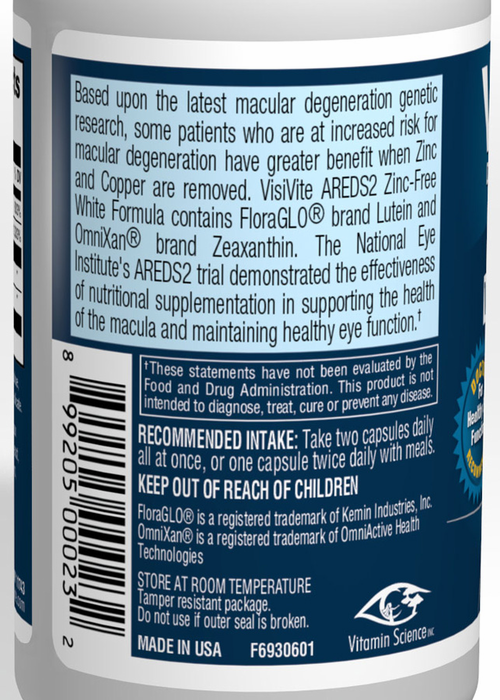 The National Eye Institute's publication of the AREDS2 results in May 2013 demonstrated the effectiveness of targeted high-dose nutritional supplementation in the slowing and prevention of age-related macular changes. The carotenoids Lutein and Zeaxanthin were 18% more effective than the original AREDS formula which contained beta-carotene. Lutein and Zeaxanthin absorption were improved when beta-carotene was removed. And yet, a study published by Dr. Carl C. Awh in the professional journal, Ophthalmology, showed that when people with the genetic make-up that includes one or two complement factor H (CFH) risk alleles is present, the mineral zinc may negate the benefits of other crucial macula-supportive antioxidants. This is a particularly common scenario in patients aged 40-65 who do not yet have macular degeneration, but who have first degree relatives (father, mother, brother, sister) who have lost vision from the condition. 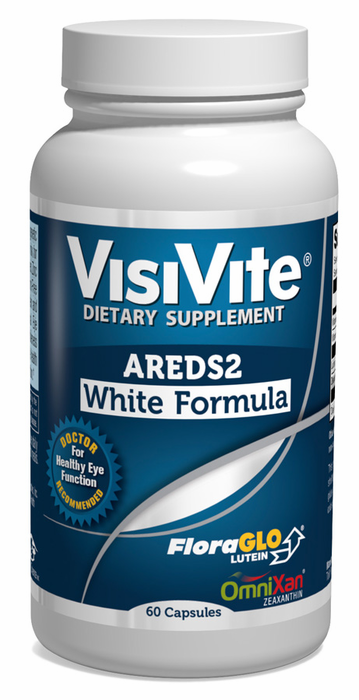 VisiVite AREDS2 No-Zinc White Formula contains high levels of Lutein, Zeaxanthin, Vitamin C, and Vitamin E, as recommended by this latest research. NO EGG or its derivatives, such as yolk, egg white, egg protein isolates, albumin, etc. NO MILK or its derivatives, such as whey, casein, caseinates, yogurt, cheese, butter, etc. NO PEANUTS or its derivatives, such as peanut protein, oil, butter, flour, etc. 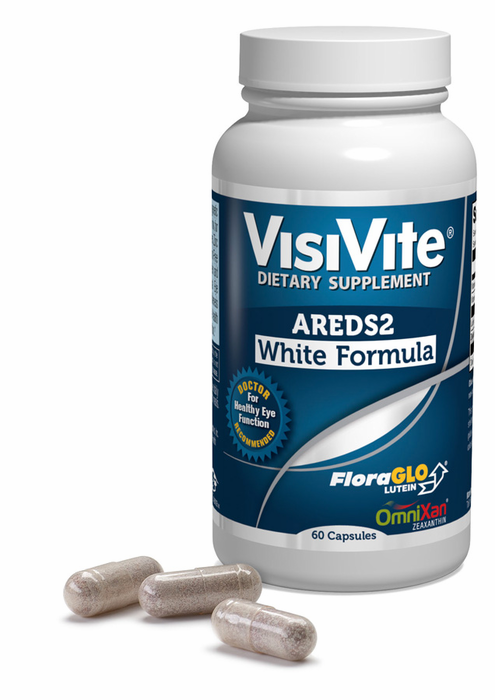 Formulated in response to requests from doctors who wanted a targeted no-zinc AREDS2 formula based on results from the latest genetic research, VisiVite created AREDS2 White Formula. 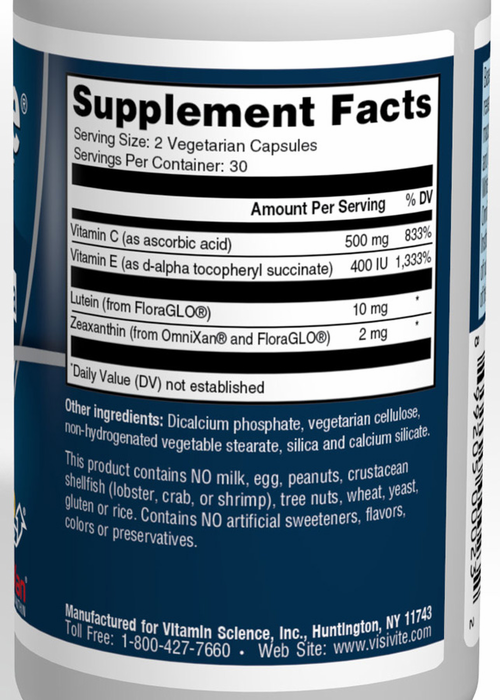 Especially beneficial for people age 40-65 without macular degeneration who have relatives with this condition. I take these on the advice of my eye doctor. I seem to be allergic to zinc. This product keeps me free of allergic reactions. Thanks! Thank you for this formula! I am really glad that you guys listened to those of us that wanted you to make a macular degeneration supplement without zinc. I have been buying individual vitamins for the last 3 or 4 years to satisfy the AREDS requirements. I don't have MD, but I have a strong family history of it and don't want to get it. So far, so good.